Met Gala 2016, Your favourite celebraties and the best looks. The Met Gala each year always creates such a big hype and conversation over every social media platform. Its all about what every major celebrity is wearing and who is the best dressed. These are some of unity radio’s favourite looks from the likes of Karlie Kloss to Kanye West. Music stars always have such different styles on the red carpet. They are wild and crazy and this are some of out favourite looks from the Met Gala this year. Beware everyone some of them are a little mind blowing. We love this look worn by Disney Channel star and music sensation Selena Gomez. She looks super thin and elegant but also like a little rock chick with the over bralet and lace up boots – we love how she pulled this off. The 19-year-old young star rocked the not so cool bowl cut but totally pulled it off. Zendaya we think you look insane, and the floor length gold dress made you look like a goddess. Madonna has never been afraid to pull of some crazy looks whilst on the red carpet but she went all out at the Met Gala and we loved it. No underwear on Madonna? Ok its cool because its you. Would we really expect anything different from Lady Gaga? She never really takes the glamorous/classy look but heads more towards ‘I’m going to wear what I want and look crazy and pretend its cool’ look. But its ok Gaga you can pull off those crazy high boots. Would the most talked about couple show up in anything other than a his and hers outfit. 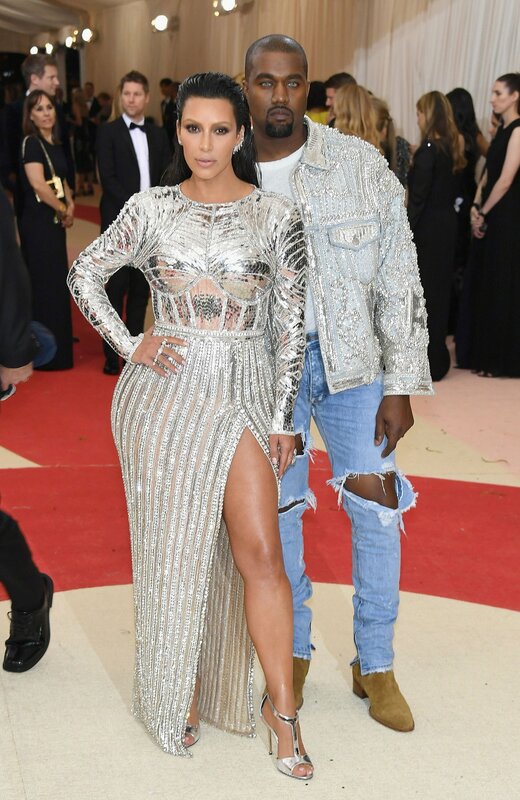 We love this Silver Balmain and with Olivier Rousteing being one of their bestfriends we already totally guessed that the whole Kardashian would be in something Balmain. At unity Radio out favourite looks must be the ones the models pull off! You can tell straight away a music star from a model as the models wear the classiest gowns showing off their tiny bodies and of course look 10/10. Here are some of our favourite looks. This look is literally everything and we love it so much. Poppy you look flawless and the beads on this dress are insane, we want to just be you for one night ok so we can wear this dress as well. Everyone says there is nothing better than an LBD and Bella showed us that even at the Met Gala, if we add a little length and turn it into a beautiful gown, that black dresses still win all round. We love the cut of this dress and how it makes you look so dam elegant. Karlie we totally have envy over you right now. The long blue strips in this dress make us want to never wear black again. Oh how we love this dress, Kendall you tiny little thing we think you looked amazing. Our favourite young couple this year and of course they looked so cute together. Gigi rocked a beautiful metallic and grey dress whilst Zane in a suit with metal sleeves. You two really look like a prince and princess. Another Balmain piece we totally loved. All these cut out dresses are starting to become I think we want in our wardrobes and its all because of you Olivier Rousteing. It was Kylie’s 1st Met Gala and we would have guessed her to wear anything other than Balmain? Kylie you totally killed it and we love you new super short bob. Nice touch. The Met Gala was another huge sucsess with so much style inspiration flying around from everyone. We loved watching it and choosing our favourite outfits, which ones where yours? Next ArticleManu Gonzalez joins Stephen Corrie for the "Live Mix"